Home Police Clearance Police Clearance purpose and how to get it. Police Clearance purpose and how to get it. How to get Police Clearance. A police certificate is an official document issued as a result of a background check by the police or government agency of a country to enumerate any criminal records that the applicant may have. The main purposes of getting Police Clearance is to submit as requirement for a job or satisfying an individual employer's request and sSeeking to immigrate or obtain visas. Recently, Police clearance is just a piece of paper like semi-like NBI clearance in form and design. 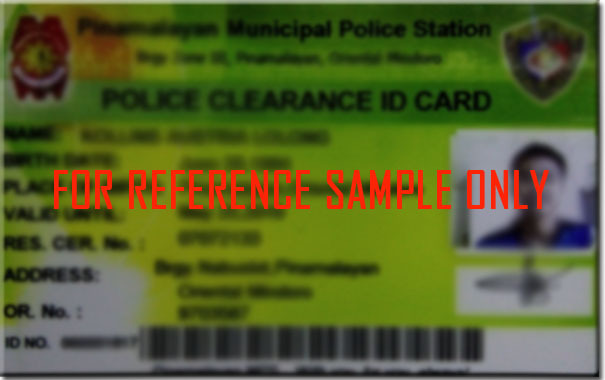 However, lately this year 2018, police clearance becomes available in an ID card with one year length of validity compared to the previous 6 months validity only. This ID card cost P250.00. 1. Cedula - can get from Brgy. Treasurer official and the Municipal Treasury Office. 2. Barangay Clearance - can get from the Brgy. Treasurer official. *Note: Releasing of ID is made after confirming all important personal details of yours.